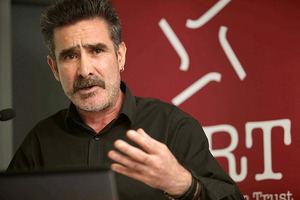 Had to look twice I was sure they had Colin Farrell as a spokesman. The council are trying to put what will be a permanent halting site right on their doorsteps without going through any planning or consultation. Bad planning causes years of problems. The council have lots of park they could put a genuine temporary site in. No they aren’t. Temporary is written large in this and Martin explains that he understands their concerns about permanency but that it is also easily solvable. 10 people died for f*ck sake, kids. those who survived are homeless. Bigots have for weeks being saying about the refugee crisis that we have to look after our own, well here they are! Look after our own. But no, we still have the ‘local christians’ more concerned with their elevated property price than giving a homeless kid whose family was just wiped out not even a roof over their head but just a field to sit in. Christ and some people still wonder why some travellers would rather not integrate with the settled community. Why the f*ck would they want to when they see this type of hatred. I hate travellers, can’t they build a halting site under the sea? “Temporary is written large in this”. And indeed it is. “more concerned with their elevated property price” – coz like worrying about your personal wealth and its accumulation should only be a preoccupation of the wealthy or the elite. It’s not for the little man? How dare they? How uppity and above their station of them. Is this your assertion? They were already living in a temporary site – for over 7 years. There were no plans to remove that site and in fact they are now going to rebuild it. Everything is temporary if your time frame is long enough. They’re the wrong sort of “our own” for the SoCoDu property p0rn NIMBYS. The sort that want no refugees, no travellers, no addicts, no single parents lowering the tone prices of the neighbourhood. 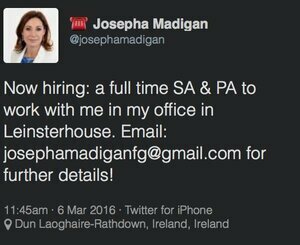 They only want some homeless types like the O’Donnells, cruelly forced out of their bog standard pile. Contact the council so Jess and suggest your own estate if you feel that strongly about it. i thought jackdaws were intelligent creatures? you’re not. Their behavior is reprehensible, but…. worst kind of human? Either you don’t know much about the “worst type of human”, or you are using English as a second language – which one is it? Must say I can understand why these residents are objecting. Very much doubt the majority of people in Ireland would be too chuffed to be told a halting site was being imposed upon them. It’s not a halting site though, it’s accommodation for one family innit? One extended family = 30 or 40 people. Y’know, this might actually be true. But it’s not just a throwaway response, it’s an indication of the sheer size of the problem, most of it created through decades of official hostility, neglect and incompetence. Apparently we couldn’t handle the idea that there are a group of people who like to travel the roads. Seriously, how difficult would it have been to let them do their thing? To be open and friendly, and maybe they’d have been open and friendly back? Compassion and flexibility were in short supply in Free State Ireland and now the damage is done and we only notice when horrible things happen out loud. Now we’ve managed to create a hostile lawless poorly educated religiously conservative underclass! Halting sites and temporary housing are only going to perpetuate the problems and pile on the resentments. It’s clear that the well meaning in settled Ireland don’t have a clue what to do – this includes me. Everybody else just snarls. That’s the end result. It was a long hard road to get here, but by God, we did it! Now we can keep making it worse! Yay! Which were burned out by travellers. Which were also burned out by travellers. That’s enough space for more than 5 traveller families. 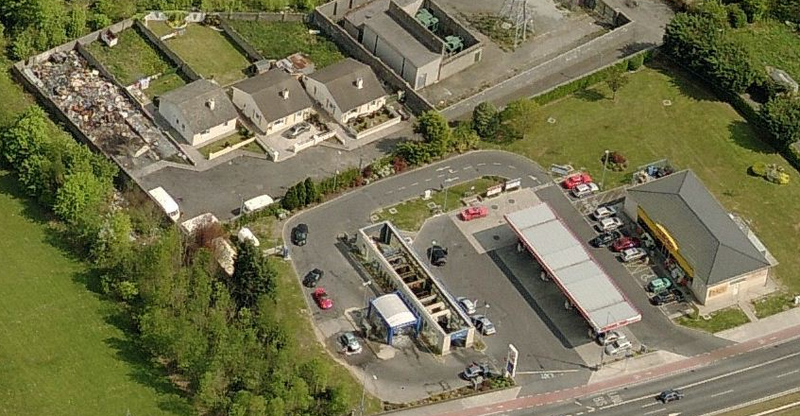 There’s also an empty space on the Rochestown Avenue halting site. Surely in the spirit of co-operation and love, those travellers already living there would have no problem housing another caravan. glendruid is set to reopen in the new year and works to start on nutgrove are supposed to start within the next 3-4 months. No mention of this from Martin though? Fresh fields only for the lads. why would he know? if you asked a dlr councillor or even checked the development plan for the area you could find out handy enough. It’s a terrible loss of life. Horrible to think it through really. I can’t imagine those protesting the relocation of the families would find it an easy thing to do. It’s dangerous at best. I don’t envy either side, but bitching them against on another in public is not the answer, if anything its the wrong approach. This is not an opportunity for DLRCOCO to find a ‘quick win’. More planning is needed. A step back, a deep breath, an emergency fund, and a 6 month plan to find a permanent location followed by a build period. Temporary solutions lead to long term problems….. like poor infrastructure, poor access, poor management and fires. And how – the place that burned down was a kip. And yet in the next post down, you get some clown arguing that we should be building more of this de-humanising squalid accommodation. And fining councils who fail to sling up these portakabin ghettos. Why should this minority group have a seperate public housing provision? If these Irish citizens want to be publicly housed why can’t go they right on the waiting list and have their homeless needs assessed like any other citizen? When I was practically homeless a few years ago and out of work etc I a. negotiated a rent reduction with my landlord b. queued up for the ‘soup’ like any other needy person c. was grateful for the intervention provided for by the state and my fellow citizens. I certainly DID NOT form an action group to articulate noisily and aggressively for the usurpation of other citizens rights over my own and then rely on an army of bleeding heart vainglorious Saint Paddys here on social media to foam at the mouth and whine at the injustice OH THE INJUSTICE of it all. If it’s only temporary let’s put them into Merrion Sq park. Would live to see the right on brigade faces after a few weeks there. i don’t blame these people at all and i don’t think the vast majority of people would either. Even if only for a short time the travelers will destroy the green, dump all their crap on it and then move on like they do everywhere else they go. anyone sticking up for these people is in the minority and a fantasist idealist. I dont understand why the Travelling community are not subject to the same laws as everyone else with respect to their local environment and social responsibility. Most well-meaning people are against what they do rather than who they are. Because neglecting to enforce laws and regulations goes hand in hand with all sorts of other neglect and marginalisation. It reinforces their outside status both to them and to the settled community. That sounds like a good theory, I’m not sure how you would demonstrate it though. At this point? Possibly. My thesis is the damage is done, and we’re crying about spilled milk (though only when people get hurt or die.) Whining about traveller’s getting free stuff, or whining about the poor treatment of travellers (‘though I wouldn’t want ’em next door to me!’) are just symptoms. Neither giving them or not giving them free stuff, and neither treating them nice or not nice are anything like solutions. Government policy needs to be burned to the ground and rebuilt with compassion, imagination, realism, firmness and extensive consultation with setlled and travellers. there needs to be a decades-long peace process. I am not optimistic. I would say your pessimism is unfortunately correct. Don’t be so naive fluffy. Volunteer your area if you feel so strongly about this. Travellers moved in to a space at the top of that road by the Golden Ball about 10 years ago – the local residents got a JCB and cut away all the soil outside the caravans in order to get them to move. They clearly do not want them there and why you feel they should be forced to, purely on the basis of proximity is baffling. As I outlined above, there are plenty of locations that already have travellers that could be quickly adapted. 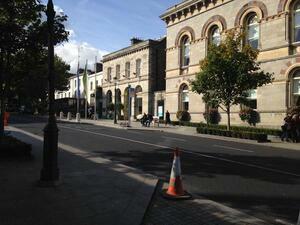 Also, DLRCC has a history of “extending” temporary sites and agreements. You can protest all you want once the “contract” has expired, but a court case is an expensive and lengthy process. 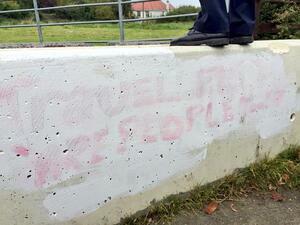 They should be very proud of effectively vandalising someone’s home. What a bunch of fupping pr***s.
Empty space at the top of the Golden Ball – the travellers moved in late at night without any consultation. Perhaps you’d be playing a different tune if you looked out your front door and travellers were setting up camp on the green opposite? Or would you have the tea and biscuits out? An insightful observation, Dόn. Hopefully your parent or legal guardian gets home soon and takes the tablet away from you. Why bother replying in a sensible fashion when it gets such nonsense replies? I’d waste my time to be perfectly honest and I can waste that on other things. that was just part of an annual donder. they come up from wexford, wicklow and kildare, stay for a few weeks and then move on before the kids go back to school. no biggie. Please articulate why an invasive minority group should have the lawful right to impinge on and routinely destroy enjoyment of public spaces and or other public amenities? ‘invasive minority group’ is your term, so you should explain that one. as regards their lawful right, every citizen is presumed innocent unless proven guilty. once an injunction is sought they usually leave handy enough. as regards any problems of littering the sensible thing would be to leave a few bins there for the duration of their stay. or do you honestly think it’s only travellers who dump rubbish? @scottser – and missing the complete irony that the destruction and invasion was not coming from the travellers. Do you like my new troll by the way? Destroying people’s enjoyment should be illegal? What are you saying here? You don’t like the look of them so their presence should be illegal? What is proposed is an usurpation of the normal planning process to facilitate the short term housing needs of a group who demand a special form of housing, also known as a ‘halting site’. That sounds like an invasion to me, so yes it is my term. Note that members of this group claim to have a right to legally trespass on public and private property which right they have asserted on several occasions on the whole in recent past (I can provide citations if you want). The courts have not generally upheld this right but housing policy has been to provide some level of this special provision I’ll grant. In my view this is bad policy and discriminatory to other groups with need for public housing e.g. more traditional types of homeless persons. Especially in the current austerity era. >> as regards their lawful right, every citizen is presumed innocent unless proven guilty. once an injunction is sought they usually leave handy enough. So your position is that the public should have to pay for an expensive legal injunctive process every time someone wants to assert their ‘rambling’ or squatters rights? I’d consider that a terrible waste of public money and bad policy. >> as regards any problems of littering the sensible thing would be to leave a few bins there for the duration of their stay. Sure. Are you saying to me that again, a minority squatters group should have a dump paid for by the taxpayers? This sounds like bad policy. Where I live when I want to create and dump rubbish I must pay a private company to remove it for me. Is it your view that I should be levied a ‘dumping tax’ while other fellow citizens can escape such a charge? Again please outline your rationale for this obviously unfair and discriminatory policy which would be in direct contravention of all relevant EU laws e.g. the Polluter Pays principle? >>or do you honestly think it’s only travellers who dump rubbish? As this is a straw man I will not address it, only to note that it’s not only Don Pidgeoni who leaves rubbish on this board either. dog – thanks for the reply. it’s an interesting area of what is perceived to be a ‘right’. there’s a dichotomy between a breach of bye-laws and what can be argued as a habitation and use of what otherwise would be ‘waste ground’. the local authority has to be mindful of the law, traveller culture, health and safety, the concerns of local residents and obviously covering it’s metphorical @rse. i’ve said it before, before you point your finger at anyone, ask your local councillor what way they voted on budget submissions for traveller accommodation. i bet they’ll lie to you. there is NO political will to spend money on traveller accommodation. 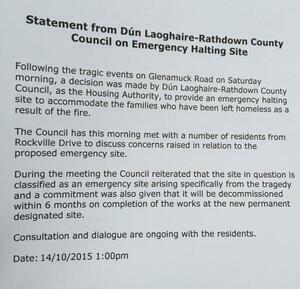 the exception in DLR is glendruid which will house homeless traveller families at a cost of 1.6m euro. the law is the law and i’m just stating it as it is. our legal system is peppered with bad law but the presumption of innocence isn’t one you should mess around with. I’m not cartin but you sound like a good man fluffy and travellers or anyone else would be lucky to have you as a neighbour. You are dishonest as you are not declaring this agenda, which a lot of people would object to. Is there anything to be said for another (posed) picture of a drowned toddler? Whats dishonest about wanting a fairer world based on equality and at that economic equality and class equality? Are you worried about the cost of your gaff in Sydney Parade Sido? Your dishonesty appears to stem from self delusion fluffy, you want the world moulded in a likeness that suits your current political perspective, whether it suits the rest of us or not. You kid yourself that you know how to build a Utopian society but in fact you are rather more clueless than Enda Kenny as to how to achieve it. Whilst all the time judging people who don’t ascribe to your beliefs – in a rather sinister manner if we are being dead honest. And yes I spotted your views on another blog I can’t remember a while back. I think somehow trying to villify someone because they want an equal society is really something that would only be spewed out by an establishment lackey. I make no secret of my utopianist views, they are here , on my blog and on politicalworld so quite why trying to say I have some sort of agenda is a bit of stating the obvious. in fairness sido, all i’ve ever read from you is critique and ego-inflating put-downs. you have never put forward anything constructive of your own for scrutiny. you’re a bit a of a coward, to be honest. @ biscuits – What really? You find a statement of the blunt and murderous truth offensive? Or should I have tried to sugar coat the pill? Well you would because you’re not a man who likes to deals in truths. If you had gone down the post and read the link provided by “Deliverance Country” you would see why. I must admit I thought everyone knew this information. but not people who live in a bubble, it seems. But hey stick with your faux outrage! I’m sure the corpses of the dead in Afganistan will be impressed by your sensitivity and “compassion”. Maybe in time they’ll express posthumous gratitude for your humanitarian intervention. There is no way that this is a temporary solution. Once those Travellers are in, they’ll never leave. It’s absolutely inevitable that they’ll drag down the value of the nearby houses. It’s not right, but that’s how the system works. If you had a gaff worth €380,000 for example and two months later it is worth half that, would you have a problem with Travellers moving in? I would protest all day long until a permanent solution with full consented planning is found. What happened that family is truly is terrible, but at the end of the day Travellers are notorious for anti-social behaviour, dumping etc etc. I would do everything possible to have a more long term solution found. And personally, not near my gaff. Oh the humanity of dwindling house prices…. People who buy houses at stupid prices than give out about losing money on them are indeed the most boring people. At least we agree on that. Thankfully we’ve entire systems devoted to keeping lively, vibrant and insightful people such as yourself from ever owning a property. I think your 15 min break is up, back to the till with you. I’m glad there’s a whole system devoted to keeping value in imaginary things like houses which should be a right not a privilege. But classy classist remark there. The mask is slipping! I was going to give you a blast there Don but Cartin got there before me. Sorry can’t better that one. That was a blast? Lol, I’ve had better farts than that but ok! Yeah, Don! ‘Back to the till!’ Mike drop! BURRRRRRRN! Because saying you work a till is an insult! Because people who work tills aren’t important! AT ALL! People who work tills are WORTHLESS! THAT MAKES IT FUUUUUUNNNNNNEEEEEEEE! Well Jaysus Nigel it wasn’t that funny. You’re right, Sido. I was lost in the moment. I can see now that you’re actually not playing with a full deck so I’ll go easier on you. i’d say you have a number of FG councillors on speed dial, eh? fair play, completely agree on that. Think of the reduction in your property tax. One woman who objected had lived in the area for 40 years, she’s probably not thinking about selling up. But then again, an increase of anti social behavior. Plus that 1 extended family will definitely grow to fill the site that is probably not fit for purpose to house more people, the collection of and failure to remove rubbish, which would in turn entice others to dump their crap there. That lady might want to sell up. Fat chance then. You can’t split the family up into different sites, because they probably want to stay together. So you need to find another site in the area so the kids can remain in the same school. Assuming everywhere you try is going to be faced with the same opposition, they will end up staying in that temporary site. Housing is a right now? Can I pick where I want to live? Can I choose not to live beside travellers? Imaginary houses? Quit sniffing glue, maaaaan! I’m trying but he’s playing hard to get! Hah! I like your hustle, kid. Ivan Yates on Newstalk this morning reckoned 99% of people in Ireland disagree with those protests and think only 1% would side with the residents who don’t want the travellers to move in. anyway, sure lets base discussion around what right wing contrarian paid-for shills on Dinnytalk “think”. I bet George Hook had a hilarious rejoinder? What about Eddie Hopes? Lucinda? or Ivan Bacik for “balance”? The public has a right to know where all these experts stand on this issue. Simple solution; use the Council Office staff car park as the site. Would definitely be a temporary solution in that case. keep it up lad, you’ll be taoiseach one day. Collins doesn’t know where the survivors are staying. he accuses the protesters of lacking compassion yet later in the interview said he understood their concerns. Might be a stupid question, but what is wrong with cleaning up the existing camp where the portacabin burned down? 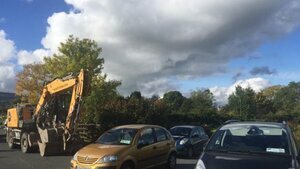 They are bringing in diggers to make temporary accomodation in a field, so would they not be able to clear up the existing camp in a few days. Send the survivors back to where ten of their family died in a fire? i imagine most of the former residents would have a huge case of the heebiejeebies going back there. i know i wouild. It’s all relative. 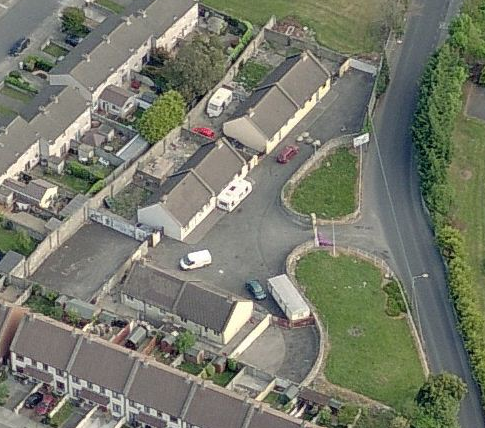 Residents of some crappy working/lower middle class cul-de-sac in Carrickmines don’t want Travellers beside them. I’d bet the residents of Shrewsbury Road or Pilot View, Dalkey wouldn’t want the residents of Rockville beside them either. Carrickmines – a haven of social welfare recipients and Daily Star readers. Pavee Point don’t know their luck! Carrickmines just sounds like a makey up TV soap locality and the big story this week is the Traveller skangers against the settled skangers.